This project analyzed the geochemistry of the clay-size fraction (particle less than 0.002 millimeters in size) of archived till samples from the highly prospective TREK area in central BC, generating a valuable new layer of earth science information and demonstrating the benefits of analyzing the clay-size fraction. 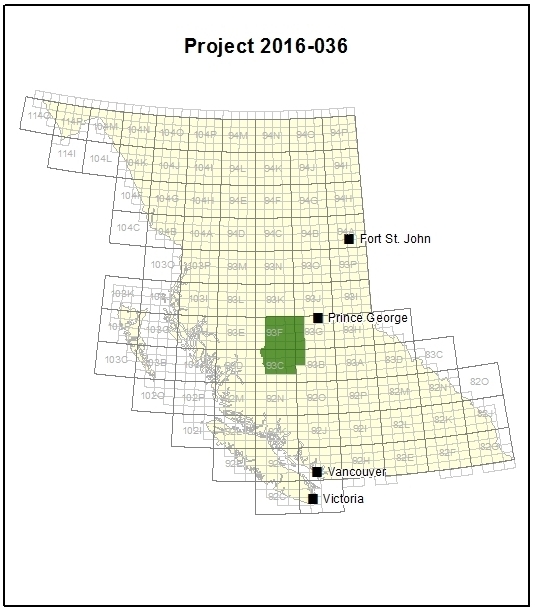 The work relates to the area of Geoscience BC's Targeting Resources for Exploration and Knowledge (TREK) series of projects. View TREK project page. BC’s northern Interior Plateau region is host to several mineral deposits, including the proposed Blackwater gold-silver mine, and has the potential to host many more. The bedrock geology of this underexplored region is largely buried under a blanket of glacial sediments of variable thickness, masking the characteristics of the rocks below. However, certain materials found at the surface can be sampled and analyzed to find trace amounts of the valuable elements, such as gold, copper or molybdenum, below. Sampling these surface materials is easier and less expensive than some other exploration methods, such as drilling, and generates valuable information for explorers focus their search for new mineral resources. Correlate the resulting anomalies with known mineral deposits. The TREK project covers a 24,000 km2 area in BC’s Central Interior Plateau from Anahim Lake in the north, east towards Burns Lake, Vanderhoof and Williams Lake. New Gold’s proposed 8.2 million-ounce Blackwater gold-silver mine is in the middle of the area, about 160 kilometres southwest of Prince George. In addition to large-scale airborne geophysical surveys and geological mapping, the TREK Project included an extensive till sampling program to provide regional-scale surficial geochemical data. View TREK project page. The study found different mineralogical compositions, and therefore different concentrations of elements, in the clay-sized fraction compared to the coarser fraction. Because of the shape of the clay minerals — tiny, thin plates with a large surface area — and the positively-charged ions within them, metals are preferentially affixed onto the clays. The clays will release these metals during analysis more easily. As a result, trace elements, including copper, are detected more accurately and precisely in the clay fraction.